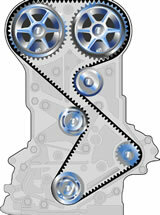 The timing belt keeps the top and bottom components of your engine rotating at the proper ratio. If the belt breaks, the engine will stop and in some cases the engine will be damaged. An interference type engine does not have enough clearance between the pistons and the valves if the timing belt breaks or skips. The repair, after breakage, on this type of engine usually includes removing the cylinder head, replacing the valves, valve guides and the timing belt.